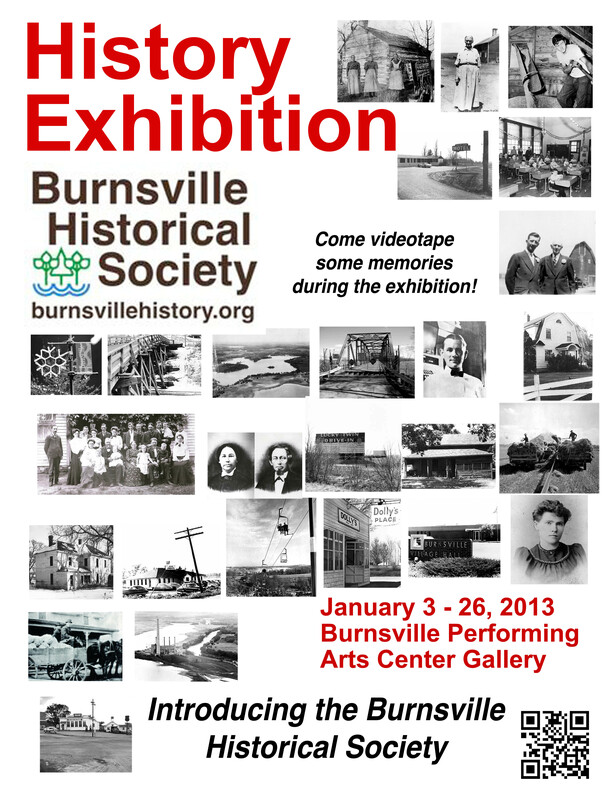 Even the Burnsville Historical Society has history! here are thousands of historical organizations across the United States. Many are formed at the state or county level. Others are dedicated to an industry, a noble cause or a favorite pastime or hobby. Some of the most interesting have sprung up around a collection of artifacts, because well, a chainsaw museum could be interesting. 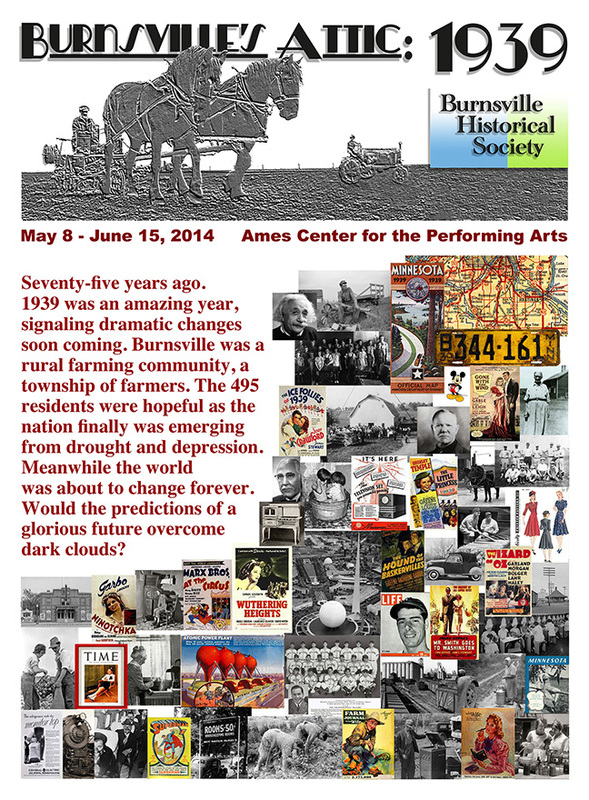 Burnsville has had history groups form from time to time, such as for the 1976 Bicentennial Celebration. 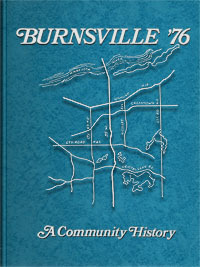 This resulted in, among other things, the publication of BURNSVILLE 1976. To this day the "Blue Book" provides the foundation and quick reference for our work at BVHS. Almost 25 years later, when "Millenium Fever" caught everyone's attention, some of the same folks realized it was a great time to publish an update! Burnsville 2000 (aka the "Red Book") also provided a useful index to both volumes. But it takes continuing effort to make an organization prosper, and most of the people who helped create these books were already over-booked as far as community service goes. The latest chapter began in 2010 when Len Nachman got a call from Evelyn Kjos. 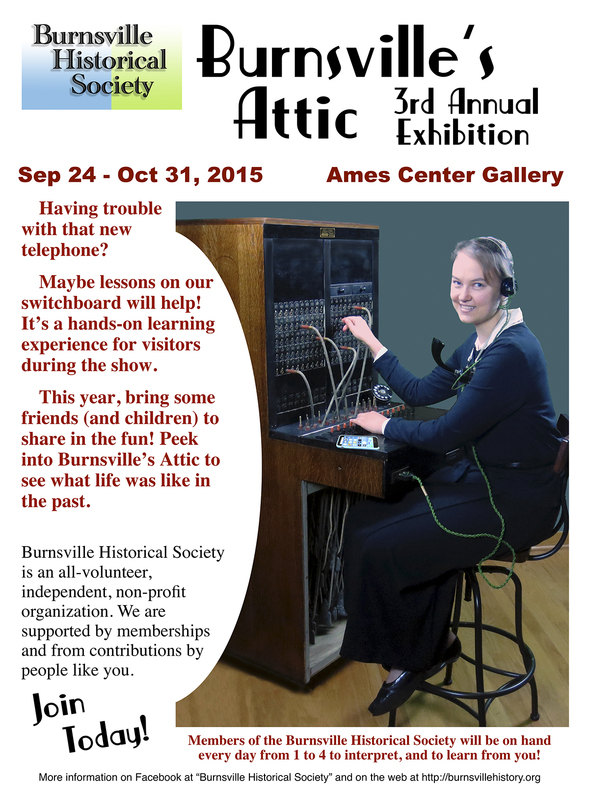 She had heard of his desire to try once again to get a Burnsville group going. 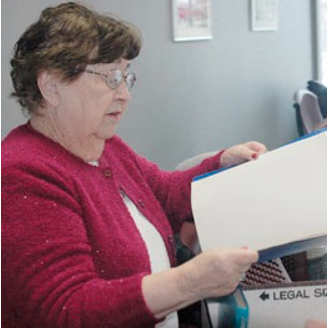 Evelyn, who passed away in 2014, was a Burnsville employee for 40 years, serving as City Clerk for much of that time. As she used to put it, when documents or photos would pass through her hands on the way to the circular file, she would say to herself, "This should be kept for history." Then she would put the item in a box for safekeeping. In February of 2012 when Kjos, Nachman, and Godan Nambudiripad cracked open those boxes at City Hall and realized what a treasure trove it was. After finding a local business to provide meeting space and a small storage closet, the society transferred those archives — all 21 boxes — to a new home. Since then quite a few people have "dipped a toe" into the hard work of growing a history association. The group has also "tried out" a variety of activites. The most exciting, and most difficult have been the three month-long exhibitions at the Ames Center, in 2013, 2104 and 2015. This year won't find us exhibiting at the Ames, but rather focussing on our onlnine presence. In one Facebook posting alone we reached over 5,000 people. far more than our total visitor count at the Ames. But we'll be back when funds and, more importantly, volunteers are plentiful! For this landmark effort we have to thank Richard Brooks, Jack Kennelly, Bea Williams, June Dille, Jean Mattson Kindem, Robert Toma, Betty Sodomka, Mimi Nachman, Hilda Kuehl and Bea Nordstrom. A host of other people loaned, wrote, edited, designed, checked and did other tasks. What could possibly have been a better Bicentennial project? Once again many of our neighbors and former neighbors deserve thanks for this effort. Thank you all! Nancy Abicht, Bob Alpers, Bob Belongie, George Burkards, Elizabeth Prest Caswell, Ray Connelly, Charlie Chrichton, Michael Crnobrna, Joy Daly, Kirk Detlefsen, Mike Falk, Susan Flecker, Nicole Gangl, Marrian Geddes, John Gessner, Paul Gilje, Janice Hennings, Jack Kennelly, Evelyn Kjos, Gary Kubat, Janet Lee, Tom Lisec, Glenn McKee, Connie Morrison, Len Nachman, Mim Nachman, Mike O'Connor, Rick Orndorf, Bernie Peroz, Tom Robbins, Grant Robinson, Mark Ryan, Susan Seiberlick, Charlotte Shover, Chuck Siggerud, Jim Skelly, Betty Sodomka-Daly, Del Stelling, Nancy Stone, Georgia Terwilliger, George Thronson, Judy Tschumper, Anne Voels, Mary Ziegenhagen.